By the glow of light cast by Hanukkah candles shining from homes in the heart of the city, we will experience a fascinating and diverse human mosaic in the neighborhoods of Nahlaot. 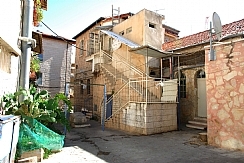 Amidst the courtyards and alleyways of the neighborhood, we will learn about the customs, lifestyles, legends, and stories of <?xml:namespace prefix = st1 ns = "urn:schemas-microsoft-com:office:smarttags" />Israel’s communities and ethnicities – some of which were brought here from afar and some of which emerged right here. We will light candles with Jerusalem families and discuss the meaning of Hanukkah, the importance of light in our lives, and the holiday customs of the various communities. The sites of the tour include Mishkenot Israel, Batei Goral, Mazkeret Moshe, Ohel Moshe, Batei Broida, and Zichron Tuvia.